Mr. Oliver, on the Tanglewood stage in Lenox, retired from the chorus three years ago. All conductors shape musical performances without making a sound. But in his 45-year tenure with the Boston Symphony Orchestra, John Oliver shaped more than 1,000 performances without even being on the stage. 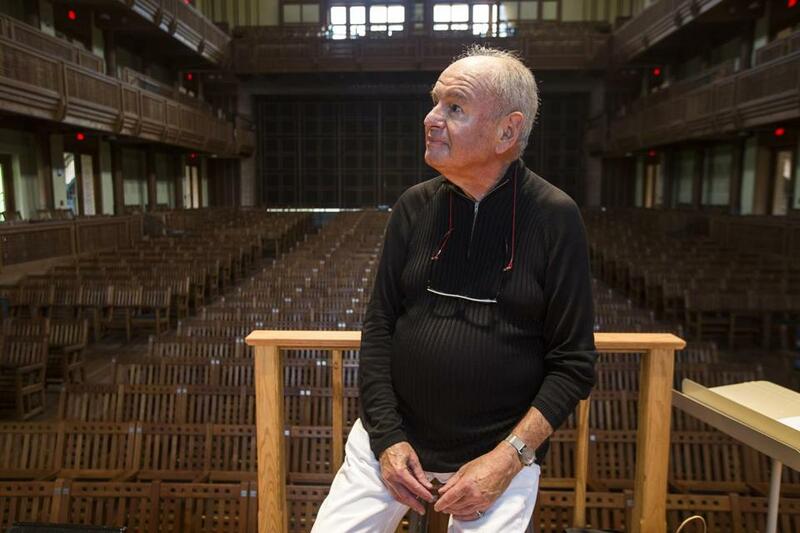 Mr. Oliver founded the BSO’s Tanglewood Festival Chorus in 1970 and led it until his retirement in August 2015. In some ways, his preparation of the singers away from the public eye — for performances that ultimately took place under the batons of Seiji Ozawa, Bernard Haitink, Sir Colin Davis, Leonard Bernstein, James Levine, Andris Nelsons, and so many others — made him Symphony Hall’s ultimate behind-the-scenes artistic figure. Yet for the thousands of choristers who worked with him over the years, he was the essence of their connection to the BSO, a galvanizing figure who took an assemblage of musically passionate volunteer singers — among them lawyers, doctors, engineers, teachers, psychiatrists, grandparents, and retirees — and forged one of the most respected symphonic choruses in the country. Mr. Oliver died Wednesday in Fairview Hospital in Great Barrington after a long illness. He was 78 and lived in Alford. Over the years, Mr. Oliver worked with some 2,200 choristers, whom he prepared for performances at Tanglewood, Symphony Hall, and Carnegie Hall, as well as for tours to Europe and Asia. The chorus under his watch sang more than 200 different works and was represented on more than 40 commercial recordings. A BSO Classics disc with the Tanglewood chorus joining the BSO in Ravel’s complete “Daphnis et Chloé,” under the baton of Levine, won a Grammy in 2009 for best orchestral performance. Mr. Oliver also was awarded the BSO’s Tanglewood Medal at the conclusion of Tanglewood’s 2015 season. Mr. Oliver was born in Teaneck, N.J., though thanks to his father’s career as an executive with General Motors he moved frequently as a child. While attending parochial school in Wisconsin, he was introduced to the organ. Soon thereafter he began conducting church choirs. After pursuing an undergraduate degree at the University of Notre Dame, Mr. Oliver moved to New England and accepted a summer job as a singing waiter at a restaurant in Cohasset. He ended up studying choral conducting at New England Conservatory, where he worked with Lorna Cooke deVaron. Mr. Oliver began his BSO connection at 24, when on short notice he prepared the Sacred Heart Boychoir of Roslindale for its role in a performance of excerpts from Berg’s opera “Wozzeck” under the baton of Erich Leinsdorf. By 1970, Mr. Oliver was working at Tanglewood and began discussions with the administration about forming a standing chorus under the BSO’s own auspices. In earlier years, the BSO had tapped different local ensembles when a chorus was needed, including the Chorus pro Musica, the Harvard Glee Club, and the Berkshire Chorus. In a previous Globe interview, he reflected on those early years and the group’s evolution. “At the beginning, the chorus sounded more youthful than it does today because it was,” he said. “Many of our members have grown up with the chorus, and today it makes a richer and a more brilliant sound. For decades under Mr. Oliver’s leadership, one particularly notable aspect of the chorus’s profile was that the singers performed everything from memory, including choral works with texts in languages such as Polish and Hungarian. Norris, the longtime member, estimated that preparing these pieces could require up to 100 hours of individual work outside of the frequent group rehearsals. Mr. Oliver, who was also an avid cook and gardener, leaves no immediate family. Services in the Berkshires will be private, and a memorial concert in the summer at Tanglewood will be announced. Over the years, Mr. Oliver’s own top list of memorable performances included Britten’s “War Requiem” with Ozawa at Tanglewood, Elgar’s “The Dream of Gerontius” with Davis, and Beethoven’s “Missa Solemnis” with Bernstein.